Journalists wait for EU leaders to arrive. LUXEMBOURG PRIME MINISTER Xavier Bettel perfectly encapsulated the mood in Brussels for the nail-biting European Council summit weekend by drawing comparisons with Irish playwright Samuel Beckett’s Waiting for Godot. The tragicomedy, which is considered a masterpiece of absurdist literature, covers the story of two characters who wait for Godot by a tree. They are told twice that he’s not arriving, and the play ends without him ever appearing. “I sometimes have the feeling that I’m in the waiting room waiting for Godot, and Godot is never coming,” continued Bettel. As Brussels was mobbed by cameramen on the eve of the European Council summit (one roundabout had a different live television broadcast down each of its roads), every moment seemed interwoven by the absurdity of the situation, but also the seriousness of it. On Wednesday night, massive army trucks had circled the three buildings hosting the EU event, and one of the main entrances had black barbed-wire fences lined up along it. In the morning, they were replaced on the roads by a bright blue bus with the slogan “Make Love, Not Brexit”. As people began to gather for the arrival of EU leaders, a small group of Swedish demonstrators carried purple signs with the claim “I Will Marry A Brit To Save the EU” and handed out roses to passers by. On turning a corner, a massive statue of a migrant in tattered clothes – a symbol of one of the EU’s greatest challenges. There were more direct moments of absurdity: the press conference scheduled for immediately after the European Council summit, where the delay to the Brexit date was meant to be announced, was itself delayed. And delayed some more. There was eventually white smoke just after 11.30pm (our time here in Brussels). As journalists waited for the announcements, they mused at how the practicalities of granting the extension could be going – games like replacing “…if the Withdrawal Agreement is passed next week” with “…if pigs fly” were commonplace. Some walked in circles outside the press room trying to find out how long they would be waiting; broadcasters ran out to appear on news bulletins or reports and returned, glued to their phones, fishing for a leak or an announcement of the extension. At around 9pm, the rumour was floated that there might not be a press conference at all… iterations of draft documents came along with those rumours. 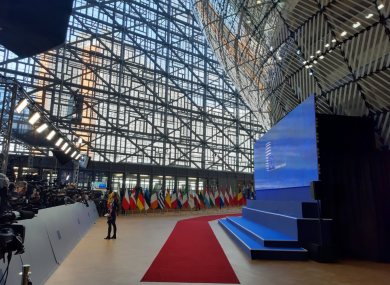 The summit was held as the European Union – politicians, advisors, and other officials – grows increasingly frustrated and fatigued by Brexit. After two years of negotiations, the crafting of detailed proposals that cover everything from the rights of citizens, to food standards, to the massive €43 billion divorce bill to be paid by the UK, that all may amount to nothing. “The lack of trust is a concern,” the first vice president of the European Parliament, Mairéad McGuinness said ahead of the summit. The EU’s Agriculture Commissioner Phil Hogan also had strong words on the border (or lack thereof). Referencing the no-deal tariffs announced by the British government last week, he said that they had to be temporary, weren’t in compliance with WTO rules, and in his view, were “illegal”. “It does give some indication of their thinking and their planning,” the former Fine Gael minister said. When asked whether the EU would reciprocate a gesture from the UK not to place tariffs on goods going to the North from the Republic, Hogan was vague and emphatic: “This is going to be an external EU border. The UK are trying to force the EU with imposing a border, and they won’t get away with this political tactic – a hard border. Even in the event of a no-deal Brexit, the UK government would have to work out some sort of future relationship with the EU. So the solution to the Brexit riddle would still have to be solved. In the end, the European Council did hold a press conference, and announced at it that they would give the UK an extension until 22 May on condition that the Withdrawal Agreement is passed next week; that new deadline date is two days before Ireland holds its European elections. This isn’t quite what May wanted, she’d requested an extension until 30 June in her letter to Donald Tusk earlier this week. If the deal isn’t passed next week, an ‘unconditional’ extension will be given until 12 April (so May’s deal doesn’t need to be passed next week) which is the last date by which the UK can organise for European elections. “We’re all waiting… to see what the British intend to do. We have to see what happens in response to Mrs May. We’re waiting… we are all concerned. “There’s all these majorities for no but we’re waiting for them to say yes to something” – a moment that might never arrive. We’re off to find a tree. Email “Waiting for clarity: Trust crumbles and tension builds in final Brexit days”. Feedback on “Waiting for clarity: Trust crumbles and tension builds in final Brexit days”.